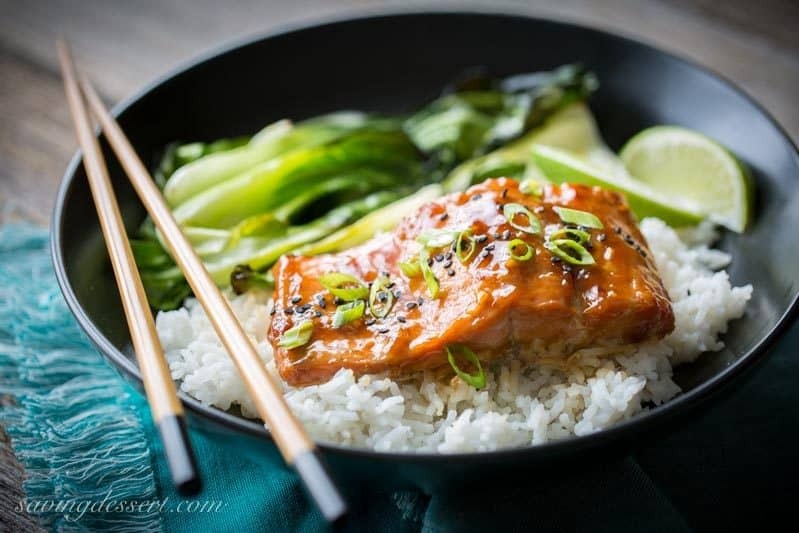 Teriyaki Salmon Rice Bowls with roasted Bok Choy ~ a super easy, quick and delicious dinner with terrific (almost intense) flavor from the simple homemade teriyaki sauce. Once you try this recipe, I bet you never buy pre-made teriyaki sauce again! Put your Jasmine rice on to cook before you start the salmon because dinner will be on the table before you can fluff it with a fork! The salmon is marinated for 30 minutes in a few tablespoons of the uncooked teriyaki sauce then baked on the same pan as the bok choy. The remaining sauce is thickened with cornstarch and cooked in under 5 minutes. You can substitute steamed broccoli, sautéed spinach or a stir fry medley for the bok choy, but I encourage you to give this a try. Bok choy, sometimes spelled pak choi, bok choi, and bak choy, is a nutrient dense vegetable also known as Chinese cabbage. There are so many ways to cook bok choy and some of my favorites are sautéed, baked, and stir fried. There are many varieties of bok choy, but today I used Shanghai Bok Choy, which is pretty cool since we’re going on a trip to Shanghai next month! Teriyaki is actually a Japanese cooking method so I’m crossing over a line here serving it with Chinese cabbage! Kitchen Tip – when it comes to salmon, I always buy wild caught found in the freezer section of my grocery store’s meat department. Salmon purchased from the display case has been frozen, then thawed, and is much more expense than the still-frozen, never thawed varieties. Unless you need it in a few hours, I say buy frozen fish and thaw it overnight in your refrigerator. No more fishy smell, no rush to make it immediately because it’s already been thawed for days, only perfectly portioned pieces of fish individually wrapped and ready to thaw. 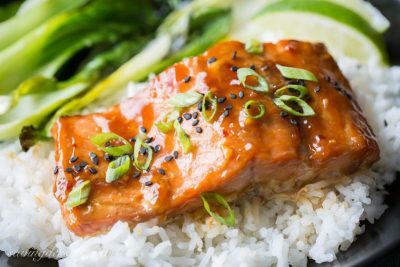 The salmon cooks up flaky and tender with an unforgettable flavor from the sticky, bold but sweet teriyaki glaze. I can’t wait to try this teriyaki sauce recipe on grilled salmon, shrimp skewers and even chicken! Finally, if you’re loving on salmon today, we have a few more wonderful salmon recipes from the archives you might like! A super easy, quick and delicious dinner with terrific (almost intense) flavor from the simple homemade teriyaki sauce. Once you try this recipe, I bet you never buy pre-made teriyaki sauce again! Combine the cornstarch and water together in a small bowl. Whisk until smooth. Set the slurry aside. In a small saucepan combine the soy sauce, sugar, mirin, ginger, garlic and crushed red pepper. Reserve 1/4 cup of the sauce and place it in a large ziplock bag or flat glass container with a lid. Add the salmon to the bag or container, skin side up. Set salmon aside for 30 minutes, turning once. Warm the saucepan with the remaining Teriyaki mixture on medium heat. Bring to a boil whisking constantly, then slowly add the cornstarch slurry, and cook until the sauce thickens, about 3-4 minutes. Set aside to cool. Preheat oven to 400 degrees. Line a baking sheet with parchment paper or lightly coat with vegetable oil or vegetable spray. Toss the bok choy with the vegetable and sesame oils. Place the bok choy on one end of the prepared baking pan. Place the marinated salmon, skin side down on the opposite end of the baking sheet. Bake both for 8 minutes then remove the pan from the oven and drizzle each salmon fillet with a little of the reserved teriyaki sauce. Bake for an additional 5 minutes or until it flakes easily. Serve the salmon fillets over rice with a portion of the bok choy. Serve with the reserved teriyaki sauce if desired. Garnish with sesame seeds and sliced scallions with a squeeze of fresh lime juice. Mirin rice wine is available at most Asian markets or well stocked grocery stores. If you can't find it, use Aji-Mirin sweet cooking rice seasoning found in the Asian section of most grocery stores. I used the Aji-Mirin by Kikkoman and was very happy with the results. We love eating salmon and are always looking for delicious new ways to bring it into our rotation. Check out these incredible Rainbow Salmon Skewers from The View from Great Island and this amazing Thai Noodle Salad with Glazed Salmon from A Beautiful Plate. I love this roundup from Cookin Canuck with 10 Healthy Salmon Recipes filed under her Quick and Easy Dinner Ideas! And finally, don’t miss this beautiful Balsamic Ginger Salmon recipe from Barefeet in the Kitchen. Have a terrific weekend and thanks so much for stopping by! That is such a beautiful meal and so full of flavor and healthy goodness. Well done. what a beautifully glossy portion of salmon! 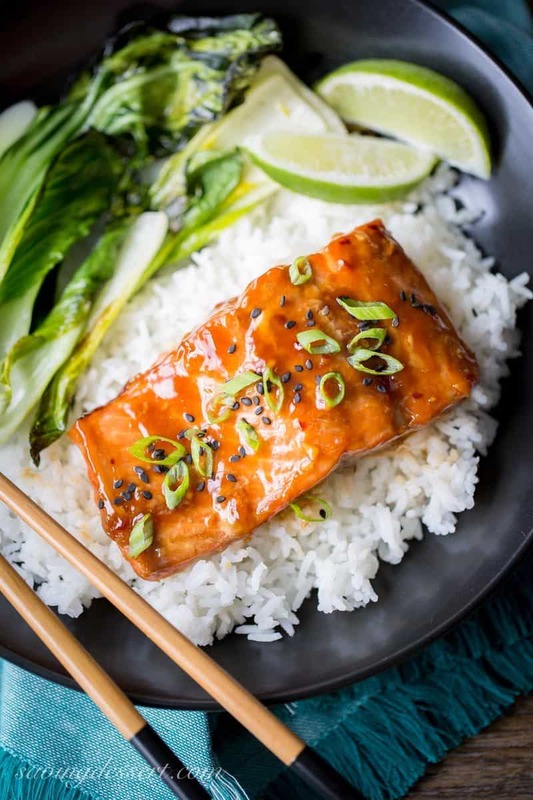 I adore teriyaki too and it imparts such wonderful flavours into the salmon and rice… mouth is literally watering! Thanks Dom 🙂 Hope you enjoyed your trip to Dublin. I want to go back!!! Such a gorgeous, Asian inspired meal! I love these flavors with salmon!!! Thanks Liz! We love it too and it’s so quick to come together – bonus! I’m with you Greg – who knows what all those ingredients really are! Love this tasty dish, Tricia! I agree with you about wild salmon. I don’t buy farmed salmon, shrimp or anything for that matter. It’s simply not safe. Beautiful meal Tricia, salmon is my favorite hands down, love that you made your own teriyaki sauce you are one talented lady. Thanks Cheri – truthfully the teriyaki sauce is so easy to make. Hope you’ll give it a try! We all love teriyaki and salmon teriyaki here. I make it for dinner but why doesn’t my dish ever look this good?! : ) It’s fabulous. I am feeling hungry already! We love it too Monica – I would love to see your recipe and I bet it is gorgeous 🙂 Have a terrific weekend! LOVE to have recipes that all go in a pan in the oven. Ha! The lazy cook here. 😉 This sounds absolutely wonderful. Fresh ginger is one of my favorites. Shanghai!! I’m excited for you and for us… to hear about it and see your beautiful photos. Yes! I’d need to pack a spoon and fork, too. LOL! Sometimes even the sushi eating ends with mishaps. LOL! As for the potty business…. hmmmm…. Thank you very much Tanna! We’re getting nervous and excited. Such a big trip. We are nuts for ginger too and it’s so good for us … bonus! Hope you have a terrific weekend too – blessings and hugs to you and yours! 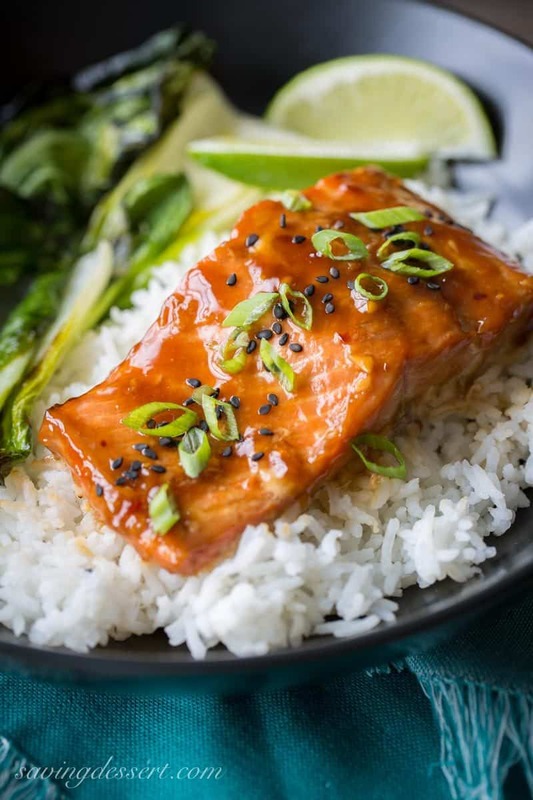 Well done on making your own teriyaki sauce – the salmon looks heavenly! Thanks Mandy – hope you have a magnificent weekend! I only my wild-caught Pacific salmon also, Tricia! The only frozen variety I’ve seen at my store is sockeye, which I’m not fond of but I’m going to check Costco next time I’m there to see if they have some. This looks so appealing and the teriyaki sauce sounds so flavorful. I need to join Costco Susan – I hear they have great deals. Thanks so much for stopping by! Looks delicious, Tricia! I love salmon and want to try your version. Thanks! Easy and tasty, that’s what I need right now. I love bok choy! Pinned and shared. Thanks for sharing and pinning Gerlinde – and easy and tasty is perfect in my book too. Thanks! Looks and sounds delicious Tricia and nice shots of it. Thank you Larry! It is delicious, sticky, sweet and tangy – just perfect! Ok, I’m running out to get a rice cooker ~ these bowls are making my mouth water, and I truly believe everything tastes better in a bowl 😉 Pinning and sharing today! Thumbs up for you making your own teriyaki sauce, Tricia. I made my own sauce before, but it didn’t taste right. What kind of soya sauce did you use here? Light or dark? Hi Angie – I used Kikkoman’s Soy Sauce which is not specified as dark, but is commonly regarded as a dark soy sauce. Hope that helps!